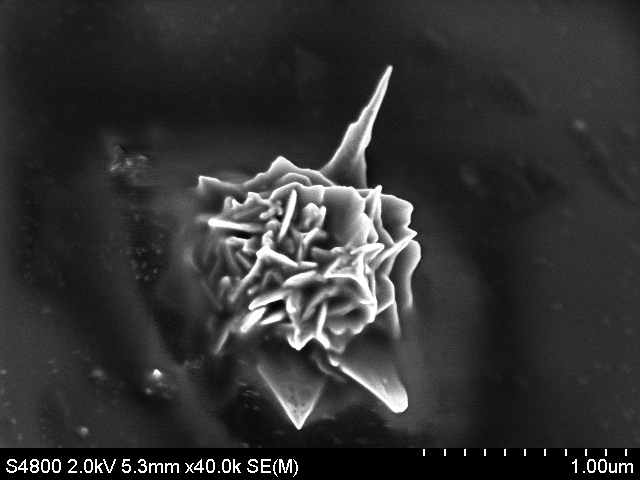 Catanionic vesicles spontaneously formed by mixing the anionic surfactant bis(2-ethylhexyl) sulfosuccinate sodium salt with the cationic surfactant cetyltrimethylammonium bromide were used as a reducing medium to produce gold clusters, which are embedded and well-ordered into the template phase. The gold clusters can be used as seeds in the growth process that follows by adding ascorbic acid as a mild reducing component. When the ascorbic acid was added very slowly in an ice bath round-edged gold nanoflowers were produced. When the same experiments were performed at room temperature in the presence of Ag+ ions, sharp-edged nanoflowers could be synthesized. The mechanism of nanoparticle formation can be understood to be a nondiffusion- limited Ostwald ripening process of preordered gold nanoparticles embedded in catanionic vesicle fragments. Surface-enhanced Raman scattering experiments show an excellent\\\\r\\\\nenhancement factor of 1.7x105 for the nanoflowers deposited on a silicon wafer.